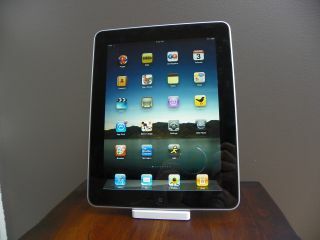 iPad - it's really here! The Apple iPad officially hits the UK today, and the tablet device is already proving to be an intensely exciting proposition for the nation. With stores finally allowed to sell the iPad after a lengthy and prolonged wait, technophiles and Apple fans will be flocking to pick up the latest gadget. The iPad has certainly not fallen short in the hype department, with the mainstream media flocking to publicise the arrival of the Apple device in their pages and on our screens. The Daily Telegraph has a report about the people queuing overnight to get their hands on the iPad, the Guardian is pushing its Eyewitness iPad application where you can look at pretty pictures and The Sun has Richard Bacon professing his love for Apple's tablet. The BBC weighs in with its own Apple iPad report, pointing out that people who pre-ordered may be disappointed, while The Mirror talks about the hype behind the launch. TechRadar, of course, has a veritable feast of articles for your delectation, including our extensive UK Apple iPad Review, and a look at the top 20 best free Apps for iPad. If you are having trouble then you can look at our guide 10 common iPad problems solved, or if you're looking to show off your new device's graphics how about the 10 best iPad games worth paying for. As you get to know your device it's definitely worth taking a look at 10 iPad tips and tricks to save you time, and if you have the device but not yet a SIM, then how about our look at the best iPad data deals for UK buyers.